David Leonhardt has another in a growing series of great David Leonhardt pieces on the nutty and dysfunctional nature of “fee-for-service” medicine in which doctors are paid for doing stuff rather than for treating illness. The problem, however, is that to totally change how medical professionals get paid would be a big disruptive change, and I see no sign that the public really wants such a change….Opting for the Barack Obama approach where you focus on reassuring people that the status quo won’t change too much seems like a smart play, even though the case for changing things a great deal is very strong. Generally speaking, this is true. It’s hard to get people to accept the inherent risk of a major change unless they’re personally dissatisfied with the status quo. But this particular issue strikes me as quite different. After all, how many patients know how their doctors are paid? How many would care if their doctors were paid a straight salary rather than fee-for-service? Would any of them be upset if they learned their doctor was switching from one compensation plan to the other? I doubt it. Conservatives could undoubtedly gin up some scaremongering talking points on the subject, but fundamentally this isn’t something that would be hard to sell to the public. There are plenty of other complicated issues related to how doctors are compensated1, but I’m not sure that public rebellion is one of them. As Leonhardt says, this is mostly doctor vs. doctor stuff. 1Oh yes, it’s complicated. Fee-for-service is a problem because it motivates the entire medical industry to order lots of tests and procedures even if they have marginal value. Boo! Then there’s capitation, where doctors are paid a set annual fee for every patient they take on regardless of how much medical attention they need. Ordering tests and followup visits eats into the bottom line, so they have an incentive not to overtreat. Hooray! But would you want to see a doctor who was highly motivated to offer as little service as possible? I didn’t think so. Paying doctors a straight salary seems like the best middle ground. But that just pushes the problem up a level: maybe individual doctors get a salary, but how do you set overall compensation for the medical group or hospital? And what about physicians in private practice? 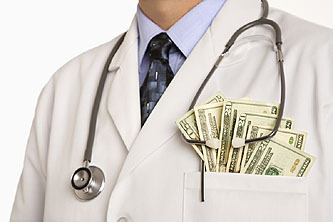 You can’t very well pay them a salary when they work for themselves, so does private practice go away? And what about bonuses? Should doctors be paid more based on some kind of formula for productivity and general wonderfulness? Would you care to propose such a formula so the rest of can all laugh at it?